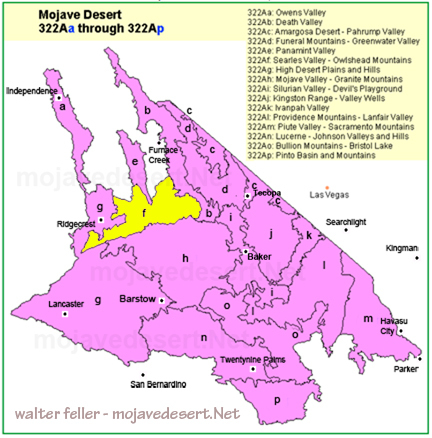 This subsection includes the Slate Range, El Paso Mountains, Quail Mountains, Owlshead Mountains, southern ends of the Argus and Panamint Ranges, Searles Valley, Long Valley, and the southern end of Panamint Valley. It has a hot, arid climate. MLRA 30g. Lithology and Stratigraphy. This subsection consists of about half upland and half alluvial plain. The upland is mainly Pre-Cenozoic granitic and metamorphic rocks, largely Mesozoic granitic rocks; Tertiary and Quaternary volcanic rocks; and Paleozoic marine and Paleocene nonmarine sedimentary rocks. The alluvial plain is Pliocene and Quaternary nonmarine sediments, mostly alluvial fan deposits; late Quaternary alluvial fan and basin-fill deposits; and late Quaternary lacustrine deposits, including salt. Geomorphology. This section is on steep to very steep mountains and valleys with very gently to moderately sloping alluvial fans and nearly level basin floor and dry lake bed. The Argus, Slate, and Panamint Ranges are oriented north-south, or toward the north-northwest; the El Paso Mountains, Spangler Hills, Straw Peak in the Slate Range, and Quail Mountains are oriented east-west, parallel to the Garlock Fault; and the Owlshead Mountains are arranged in a semi-circular pattern that is attenuated by the Garlock Fault. The elevation range is from about 1200 feet in Long Valley up to 5578 feet on Straw Peak in the Slate Range. There are many peaks higher than 5000 feet above sea-level. Mass wasting, fluvial erosion and deposition, and eolian deflation and deposition are the main geomorphic processes. Soils. The soils are mostly Lithic Torriorthents and Lithic Haplocambids on granitic and Pre-Cenozoic metamorphic rocks; Lithic Torriorthents and Lithic Haplargids on volcanic and sedimentary rocks; Typic Torriorthents, Typic Haplocalcids, and "badlands" on alluvial fans; and Typic Torrifluvents and Typic Torripsamments on basin floor. The soils are well drained, except on poorly drained playas. There are Salids on poorly drained playas lacking vascular plants. Soil temperature regimes are thermic; and soil moisture regimes are aridic. Vegetation. The predominant natural plant communities are Creosote bush series on fans and lower mountain slopes and Shadscale series on higher mountain slopes. Also, there is some Black bush series on high mountain slopes. Mixed saltbush series is common on basin floor and Iodine bush series and Saltgrass series are present on wet basin-fill and lacustrine deposits. Greasewood series occurs in riparian areas and around saltmarsh. Grasslands: Alkali sacaton series, Big galleta series, Indian ricegrass series, Saltgrass series. Shrublands: Black bush series, Brittlebrush series, Catclaw acacia series, Creosote bush series, Creosote bush - white bursage series, Desert-holly series, Fourwing saltbrush series, Greasewood series, Hop-sage series, Iodine bush series, Mixed saltbush series, Scadscale series, White bursage series. Climate. The mean annual precipitation is about 4 to 10 inches. It is all rain in the valleys, but some snow at higher elevations. Mean annual temperature is about 50� to 70� F. The mean freeze-free period is about 200 to 300 days. Surface Water. Runoff is rapid from mountains and alluvial fans and slow from basin-fill. The water drains to Searles Valley on the west, to Panamint Valley through the middle of the subsection, and through Long Valley to Death Valley on the east. Streams are dry most of each year. There is temporary ponding on playas, or dry lake beds.